As I’ve moved around the country, I’ve asked my dear friend to send me batches of za’atar, as I found it difficult to locate in local stores. To entertain me, he obliged, but after several years of shipping me spices around the country, he empowered me to make my own by walking me through the process. 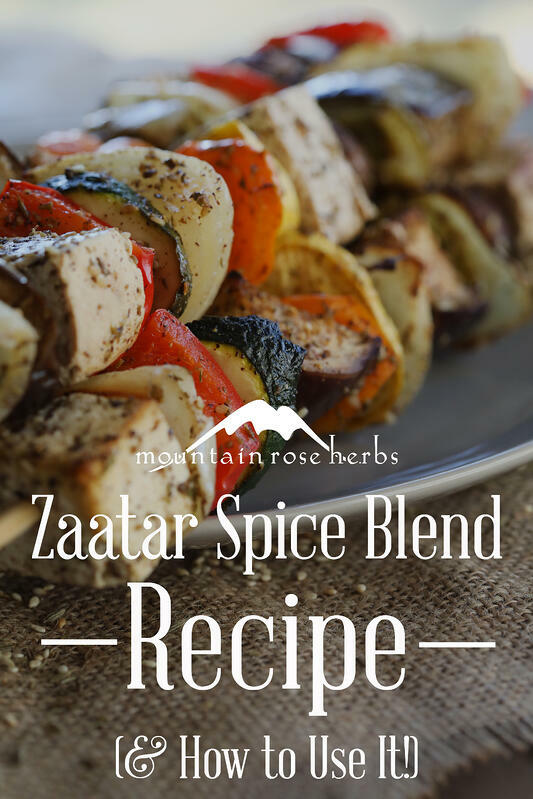 As I tinkered with the recipe, I found that blending the high-quality aromatic spices to which I now have access, with freshly toasted ingredients, added even more flavor and life than the pre-blended version I loved so much. I’m delighted to be able to share this recipe with you so that you can add some fresh flair to the creations coming out of your culinary art studio—your kitchen! Heat pan (I prefer cast iron) on medium heat. Once pan is hot, add cumin seeds to dry pan and lightly toast, stirring constantly, for about 1 minute. Grind seeds with mortar and pestle to coarse powder, or to desired consistency. Transfer to mixing bowl. Put pan back on burner. Once hot, add sesame seeds and toast, stirring constantly, until seeds are golden brown. Add to mixing bowl and combine. Add remaining ingredients to mixing bowl and blend well. Transfer to pantry jar or cork top spice jar and enjoy! Yields about 12 large skewers. 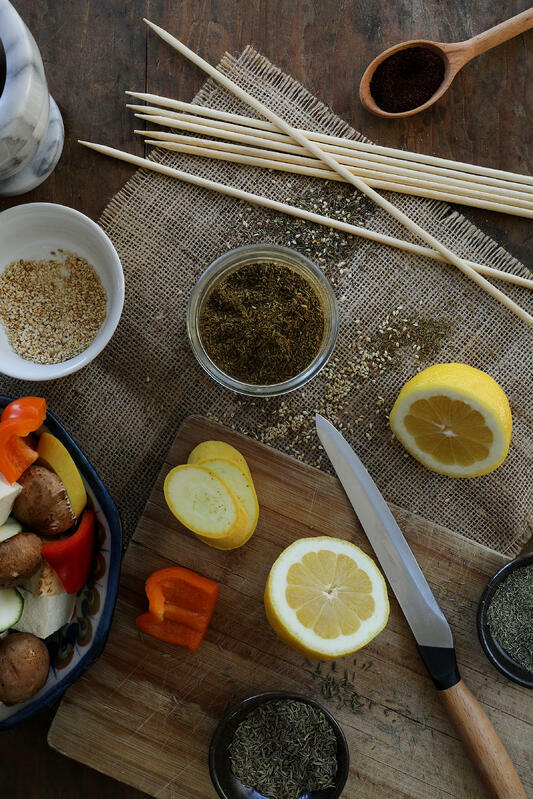 If using wooden skewers, soak them in cold water so they don't burn in oven. 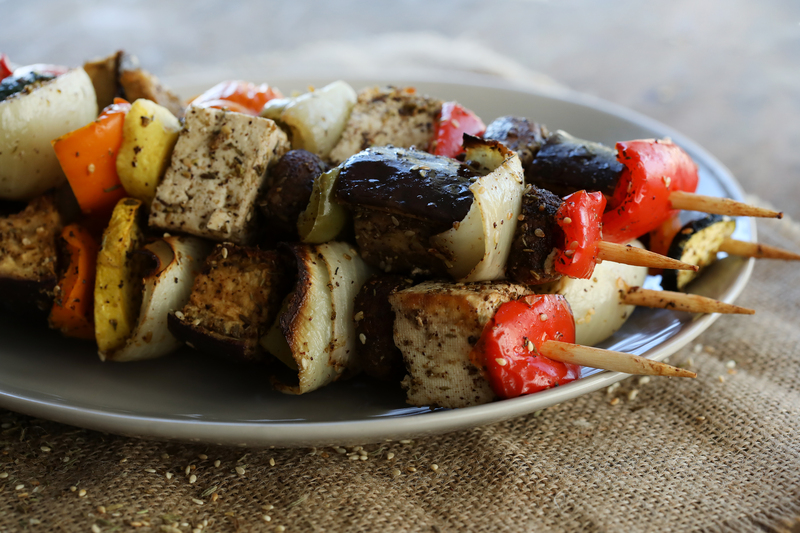 Cut bell peppers, zucchini, eggplant, onion, and tofu into roughly 2-inch pieces. Leave the mushrooms whole (for easier skewer threading). Transfer to large mixing bowl. 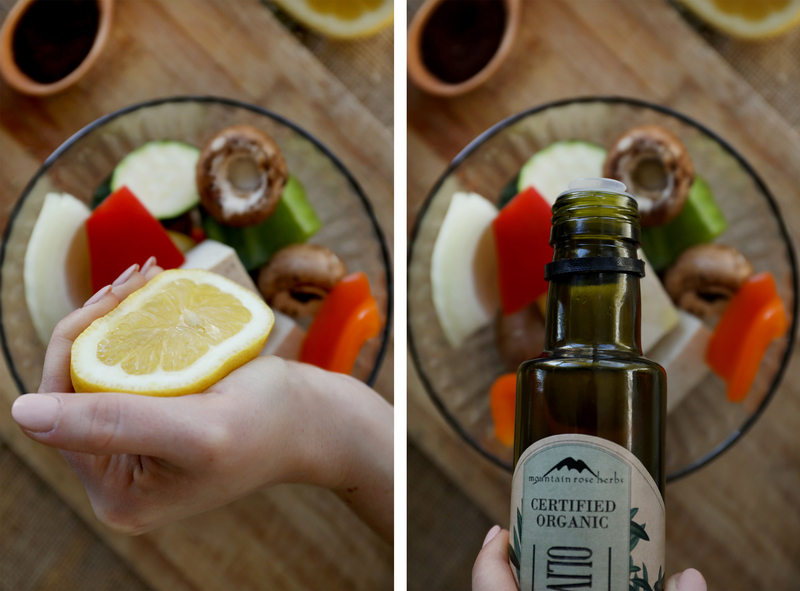 Drizzle olive oil, lemon juice, and spices onto ingredients in mixing bowl. Gently toss to coat everything evenly. Be gentle to avoid breaking apart tofu. Slide the ingredients onto skewer sticks, alternating colors for more visual appeal. Line cookie sheet with parchment paper and lay skewers on top. Bake for 30 to 40 minutes, or until reaching desired texture. Serve hot and enjoy as a stand-alone dish or with your favorite hummus spread! 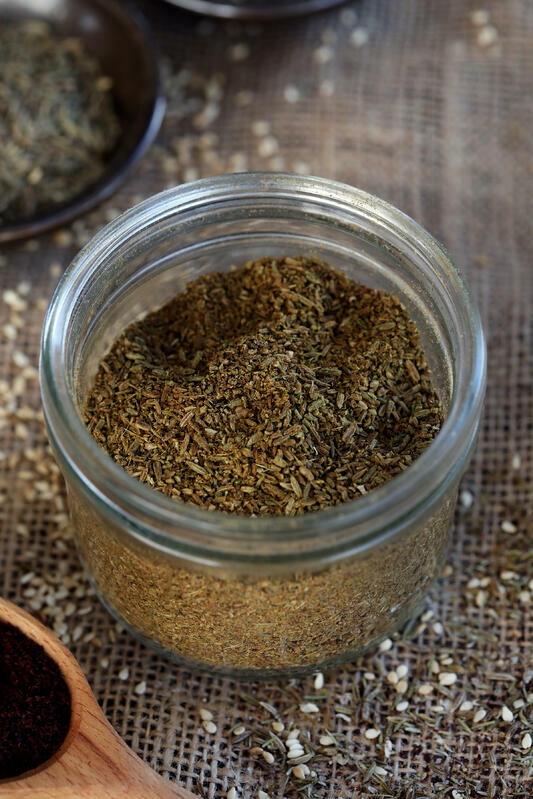 There are countless other ways to incorporate za’atar into your cuisine, but here are 10 of my favorites! 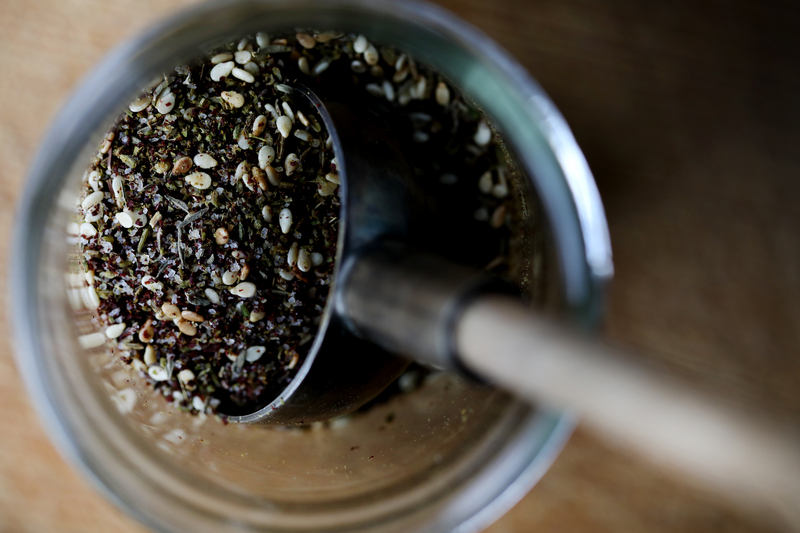 When storing your za’atar blend, choose a bottle that doesn't have a shaker top. Because the ingredients vary in size and density, I prefer a pantry jar so I can spoon out the mixture and get a more even balance of the mix. The spice blend will last several months, but to get the freshest flavor from the toasted ingredients, I recommend making in small batches. Do not try to toast the cumin seeds and sesame seeds at the same time. The sesame seeds take longer to toast. You can choose to grill the skewers instead of baking. Grill over medium-high heat for roughly 30 minutes. Each grill cooks differently, so continue to check until your tasty treats look like they are to your preferred texture. Interested in Adding other international Flavors to Your Table?